But the Colonial Revival-style hotel that was first opened in 1909 is sprawling to say the least. The hotel features 420 rooms plus ballrooms, dining areas, and an underground cave system (more on that, later!) 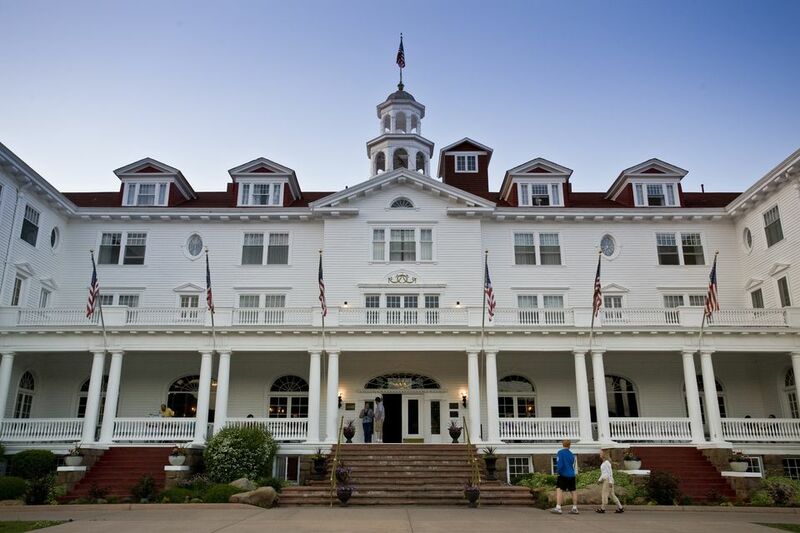 The hotel’s most famous stunt, perhaps, was creeping out horror writer Stephen King—so much so that he penned The Shining. But several other guests retell ghost stories of their own, reporting lights flickering off and on, doors abruptly slamming shut, seeing shadows, getting chills, and hearing the laughter of children. Before we narrow down the most haunted places in the hotel, we picked up a pointer from a seasoned tour guide at the hotel on how to best capture ghosts on camera. Her pro tip: Take five or six quick shots to capture a fleeting spirit. Oh, and bring up back-up batteries because paranormal experts will tell you if spirits are present, they’ll have a draining effect on your batteries. Now you’re ready to capture orbs. (A television screen outside of the The Stanley Hotel’s tour office features plenty of ghosts caught on camera by tour guests). Ready to proceed? Here’s where you’re most likely to find ghosts. And, we double-dog dare you to book a night in room on the fourth floor. Perhaps the most famed spot in the Stanley Hotel, this is where horror writer Stephen King spent the night and got the inspiration for his 1977 bestseller "The Shining." You can soak up the same Rocky Mountain views that King got when he stayed there. An added amenity? The room has a library of King novels. When King and his wife arrived at the hotel, it was closing down for the season and they were the only overnight guests staying there. They ate dinner in an empty dining room while pre-recorded orchestra music played before retreating to their room on the spacious (and eerily empty) second floor. King woke up that night to a terrifying dream about his 3-year-old son being chased through the corridors and screaming. King jerked out of bed, realizing it was a dream. He lit a cigarette on the balcony and the plot for his now-famous book shaped up. The room is thought to be haunted by Elizabeth Wilson, AKA Mrs. Wilson. She was the hotel’s head housekeeper and, during a storm in 1911, was injured during an explosion as she was lighting the lanterns in room 217. She survived, though broke her ankles and her spirit seems to be a regular in the room. Guests have reported items moved, luggage unpacked, and lights being turned on and off. Oh, and Mrs. Wilson is old-fashioned: She doesn’t like it when unmarried guests shack up together, so some couples have reported feeling a cold force come between them. One of the biggest myths about the room is that it’s never available. Not true! You can actually book it and stay there if you dare. From an architectural standpoint, the staircase between floors in the hotel’s main guesthouse is a stunner. But the area has also been dubbed “The Vortex” a natural spiral of energy. It’s also known as the “rapid transit system” for ghosts that are known to haunt the hotel. There’s a lot of paranormal hubbub said to be happening in this famed concert hall. Paul, one of the well-known ghosts haunting The Stanley, was a jack-of-all trades around the hotel. Among his duties? Enforcing an 11 p.m. curfew at the hotel, which could be why guests and workers hear “get out” being uttered late at night. The area is also a favorite spot for hotel founder Flora Stanley’s ghost to play the piano. A few of Paul’s antics: A construction worker reported he felt Paul nudge him while he was sanding the floors and tour groups on The Stanley ghost tour have reported he flickered a flashlight for them. Another ghost known to wander about Concert Hall is Lucy, who quite possibly was a runaway or homeless woman who found refuge in the hall. She entertains the requests of ghost hunters, often communicating with them with flashing lights. Stanley historians, however, aren’t quite sure about her pre-death connection to the hotel. More than a century ago, the entire fourth floor was a cavernous attic. It’s where female employees, children, and nannies stayed. Now, today’s guests will report hearing children running around, laughing, giggling and playing. Plus, there’s a famous closet that tends to open and shut on its own in this room. Really, you get a badge of bravery for staying in any room on the fourth floor. But, bonus points if you can book room 428. Guests have reported hearing footsteps above them and furniture moving about. But that’s actually physically impossible given the slope of the roof, tour guides say. The real haunt in this room, though, is a friendly cowboy who appears at the corner of the bed. From antique mirrors and portraits, there’s plenty to distract the eye on the grand staircase at The Stanley. But it could also be a popular passageway for the hotel’s resident ghosts. In 2016, a visitor from Houston snapped some photos on the grand staircase and, upon returning home and reviewing them, spotted an apparatus at the top of the staircase. The thing is he doesn’t remember anybody else being on the staircase at the time he was taking the photographs. The ghostly image of a woman is at the top of the stairs. If you go on the 75-minute night spirit tour at the Stanley (you don’t have to be a hotel guest to get in on it, but you should book in advance! ), your tour will come to an eerie halt at the end with a visit to the underground cave system. Workers moved about the hotel through the caves in the early days so it makes sense this is a popular haunt. Skeptics will pass off the haunts as breezes from the historic piping and ventilation systems. But, beneath the hotel is a higher-than-average concentration of limestone and quartz, which some ghost hunters believe help capture energy at the property.